Secret Garden. This is a hidden corner in Cambridge, England. This lovely old garden has been tended for probably more than a century. I wonder what’s behind the old wooden door? Set on the banks of the River Cam, from which the city gets its name, the city of Cambridge is a labyrinth of cobbled streets, hidden lanes, and tiny passageways. 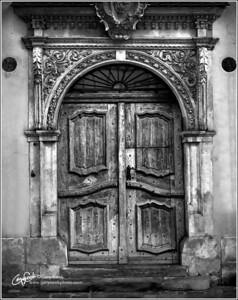 Within the city are countless ancient doors that have survived for generations and, in some cases, for a thousand years of history. 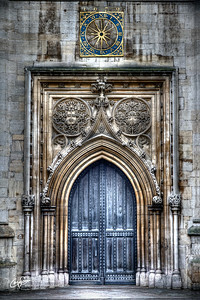 This is the main door of Great St Mary’s Church. I used a monochrome top image to control color bleed-through from the underlying full color image. This emphasizes the texture and tones of the timber and surrounding stones. 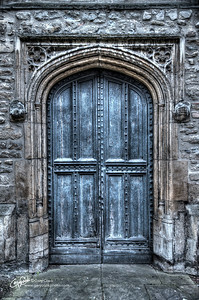 Trinity College Door. 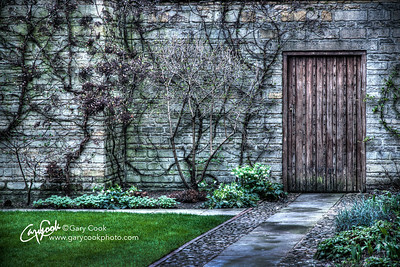 This is the ancient door of Trinity College, Cambridge, in the UK. Trinity College itself was founded by King Henry VIII, but it was formed by amalgamating two much older colleges, Michaelhouse and King’s Hall. The colleges were amalgamated after King Henry VIII passed an act of parliament giving him the right to close and confiscate the property of any religious house of the time. The universities of that time were often religious in nature and so to try to stave off disaster the college professors and the local clergy appealed to King Henry VIII’s then wife, Catherine Parr, to save the colleges. The King agreed but forced the amalgamation of the two founding colleges. 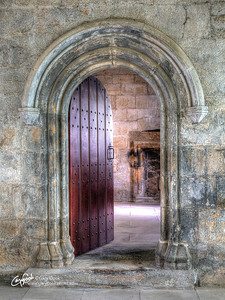 The door shown here forms part of the original King’s Hall, which was first founded in 1317 by Edward II, and refounded by Edward III in 1337. The inscription above the door on the right hand side records Edward III’s founding in Latin, shown as the year MCCCXXXVII (1337 in Roman numerals). The eldest son of Edward III, Edward of Woodstock, is also inscribed above the door, known more popularly in history as the Black Prince. 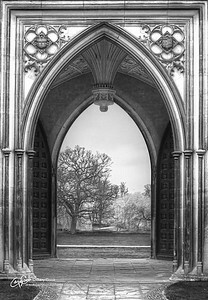 Imagine the history that has passed through this door... notable alumni include Sir Isaac Newton, Ernest Rutherford, Niels Bohr, Bertrand Russell, Lord Byron, to name just a few. Trinity is also home to the beautiful Wren Library, the most fascinating and historically significant Library I have ever visited. The student bicycle propped against the door frame shows the immense scale of the door. Although this door looks ancient, it’s actually relatively new. Charles Stuart, the 1st Baron Stuart de Rothesay, built Highcliffe Castle on the cliffs overlooking the sea at Highcliffe on the Dorset coast of England between 1831 and 1835. The magnificent building was once lavishly furnished in the style of 18th century France and it remained a family home until the 1950s when the home fell into disrepair. In the late 1960s two fires destroyed most of the building and it remained largely derelict until 1977 when the local city council purchased the remains. Today it is a thriving community asset, hosting numerous concerts, weddings and celebrations. Kraków is one of the oldest cities in Poland, dating back to the 7th century. Situated on the river Vistula, it is one of Europe's most beautiful cities, and the Old Town has been declared a UNESCO World Heritage Site. Kraków is the former city home of Pope John Paul II, before he was elected to the Catholic Papacy in 1978. Within the cobbled streets of the Old Town are hundreds of ancient doors like this, each with its own character and style. This one attracted my attention as being a particularly fine example from the city. These are the ruins of the original Norman castle, standing on an ancient Saxon motte (a man-made hill) overlooking the River Avon as it passes through the town of Christchurch, England. 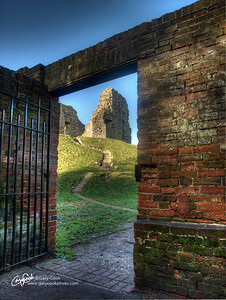 After the Norman conquest of 1066 the castle's defenses were strengthened by the addition of a ditch and bailey. The castle dominated the surrounding countryside for centuries until, in 1652, Oliver Cromwell ordered it to be destroyed, fearing such a powerful stronghold might help the Royalists to regain power after their defeat in the English Civil War of 1642–1651. 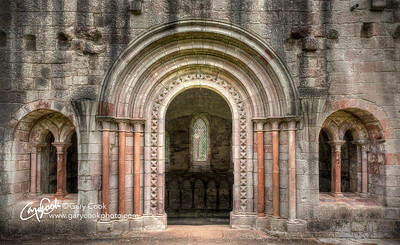 The view here is through a narrow gateway leading from the adjacent Priory. Salisbury Cathedral. 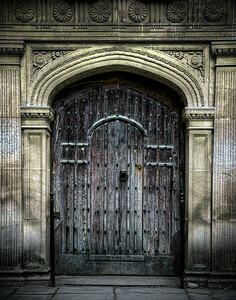 Some of you must have realized by now that I have a thing for doors; especially old doors. 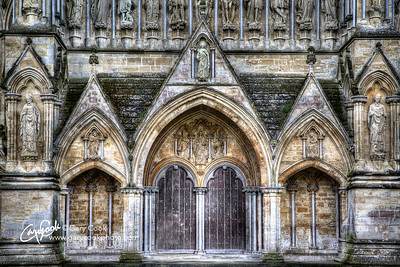 I've posted several images of the inside of Salisbury Cathedral, in southern England, but this is an image of part of the outside detail. The main part of the Cathedral was finished in the late 1250's and today the Cathedral is most famous for housing the world's oldest working clock (from around AD 1386) and it has the best surviving copy of the four original copies of the Magna Carta. But even with these treasures, the architectural detail stands out. 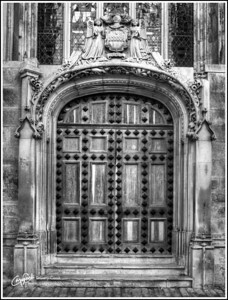 The doors here are a perfect example, with exquisite detail in the stonework from the hands of masons, stretching back in time by 8 centuries. Cambridge is a wonderful ancient city in the United Kingdom. Set on the banks of the River Cam, from which the city gets its name, is a labyrinth of cobbled streets, hidden lanes, and tiny passageways. 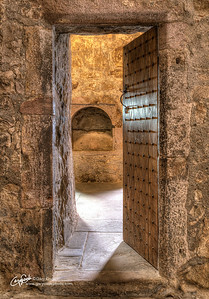 Within the city are countless ancient doors that have survived for generations and, in some cases, for a thousand years of history. This is just one of many that caught my eye as I roamed the streets of Cambridge. 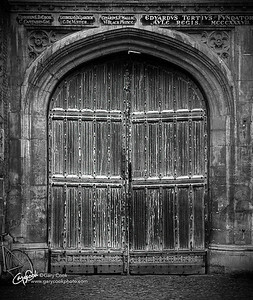 The ancient patina of the door makes this an ideal subject for pseudo-color treatment; a monochrome top image is used to control color bleed-through from the underlying full color image. This emphasizes the texture and tones of the timber and surrounding stones.